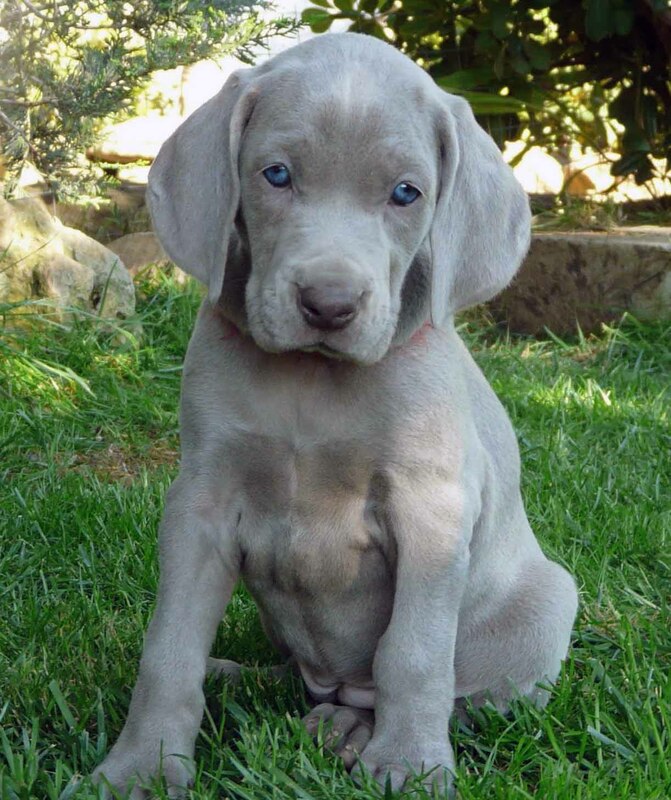 The short, velvety coat and piercing eyes of the Weimaraner give the breed a very distinct appearance as well as an air of aristocracy. Their high intelligence and hunting instincts make for a very keen and capable dog. Often nicknamed the “Grey Ghost,” dogs of this breed typically have very light coloring all around. Their exquisite eyes are always light in color, ranging from lightest amber, grey, and blue. They have smooth, athletic bodies and can display either short or slightly longer coats. The short coats are very tight to the body, hard, and smooth. 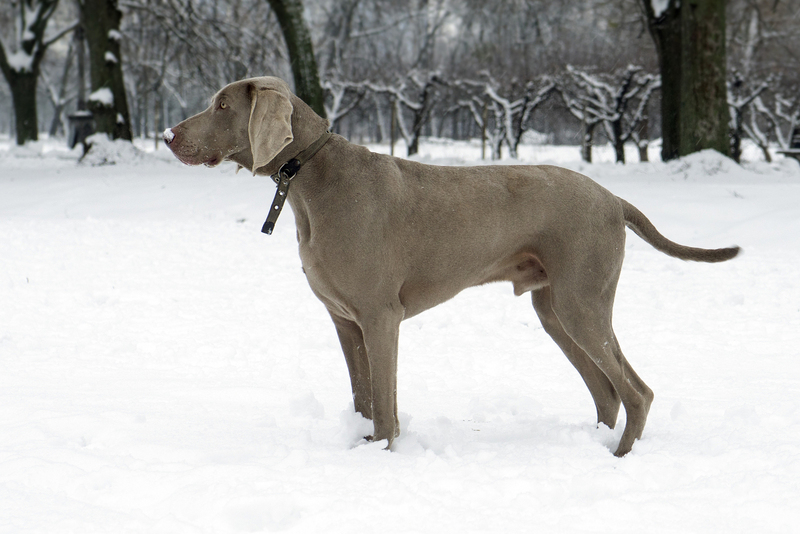 Weims with longer coats will usually have thicker fur covering the ears, paws, and feathering on the tail. Their silky coats are usually in shades of charcoal, gray, and even bluish gray. They have traditionally had their long, slinky tails docked, with docked tails even being a breed standard in some organizations. Docking is purely for aesthetic appearances and is now illegal in several countries. Historically utilized as a hunting dog, Weims have webbed paws and a love for water that make them great swimmers. They also make great family pets and have strong desires for companionship and thrive on family attention. A full grown Weimaraner will stand 23-27 inches tall and weigh in around 55-80 lbs. They are also known for living to be 11-14 years old. 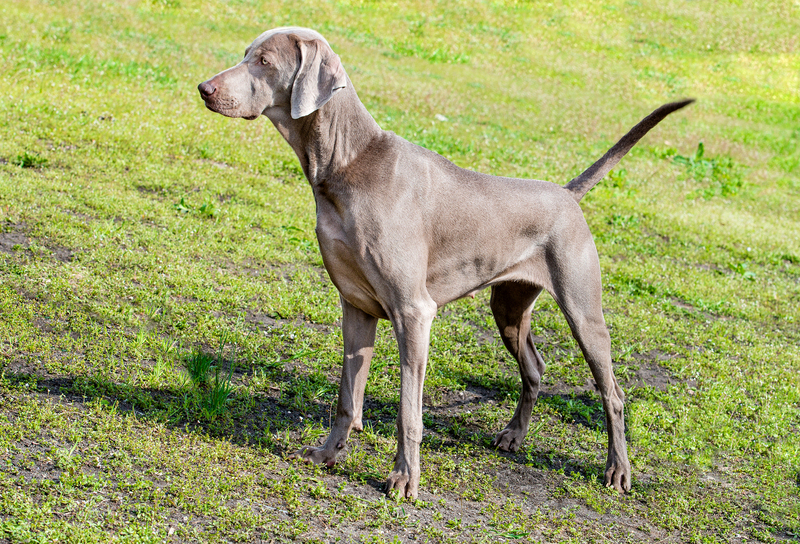 Weimaraners are a relatively low-maintenance breed as far as grooming is concerned. The smooth, hard coats of this breed make an excellent barrier to dirt and rarely require bathing. An occasional bath will help keep them fresh, but Weims are relatively clean dogs and hardly have bad odors. Periodically wiping them with a damp cloth will keep them fresh between baths. While their fur is quite short, it does still shed and regular brushing will help get rid of excess fur. Soft bristle brushes and rubber grooming mitts will work best for this breed. 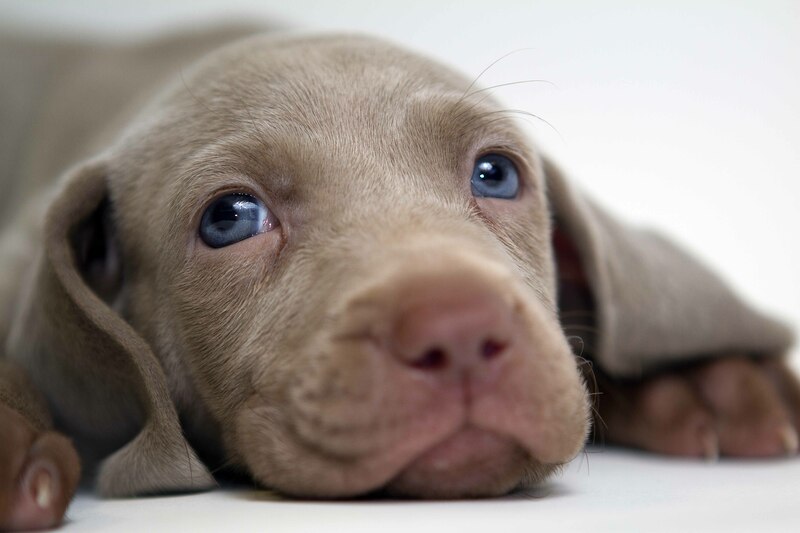 Weimaraners have hanging, floppy ears that need to be checked regularly to avoid infection. Wiping the outsides of the ears with a cotton ball and approved ear cleanser will greatly help avoid buildup of bacteria. Trimming down their strong nails will also be necessary if they don’t manage to grind them down naturally. Due to their high energy levels, most Weims will be able to keep their nails filed short, but checking the length is always a good idea. They are a very people-oriented dog and will often follow their owner unwaveringly throughout the day. 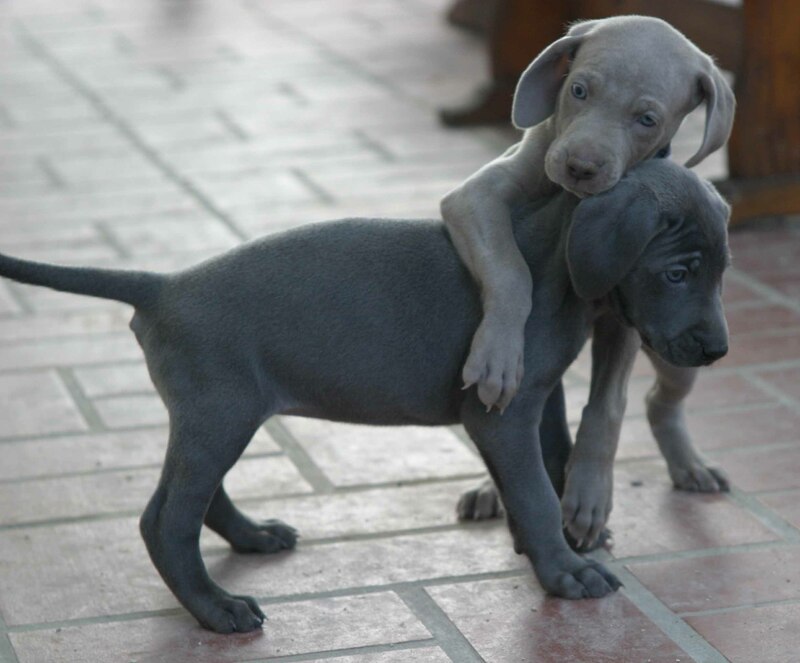 Weimaraners develop strong bonds of affection and loyalty to their owners and thrive in a positive family environment. Keeping them in the family lifestyle will help keep them happy and healthy, as they have strong desires to be with their pack. Their super short fur doesn’t provide much protection from the elements and they do not thrive in extreme cold or hot climates. Their high energy levels drive them to exercise and play frequently and need to be adequately exercised. Active owners are best suited for the strenuous task of keeping up with an enthusiastic Weimaraner. They also can exhibit a very strong stubborn streak, but this can be overcome with proper training. Beginning training early will help focus their boundless energy and rambunctious behavior. 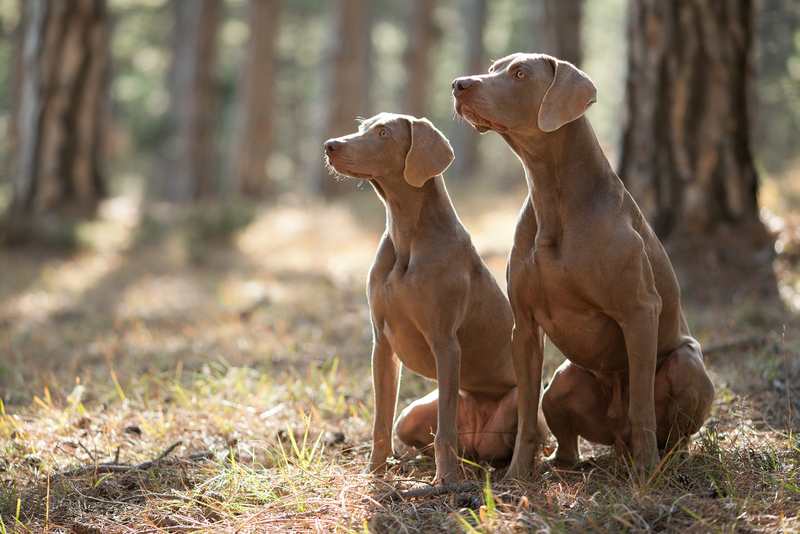 They enjoy active, exuberant play and may knock down smaller children while romping with their little pal, Weims have powerful hunting instincts which they drives them to attack perceived prey such as cats and smaller dogs/animals. They may even try to “hunt” a passing jogger if not properly trained. Once trained, they’ll be content to hunt down chew toys and tennis balls instead. 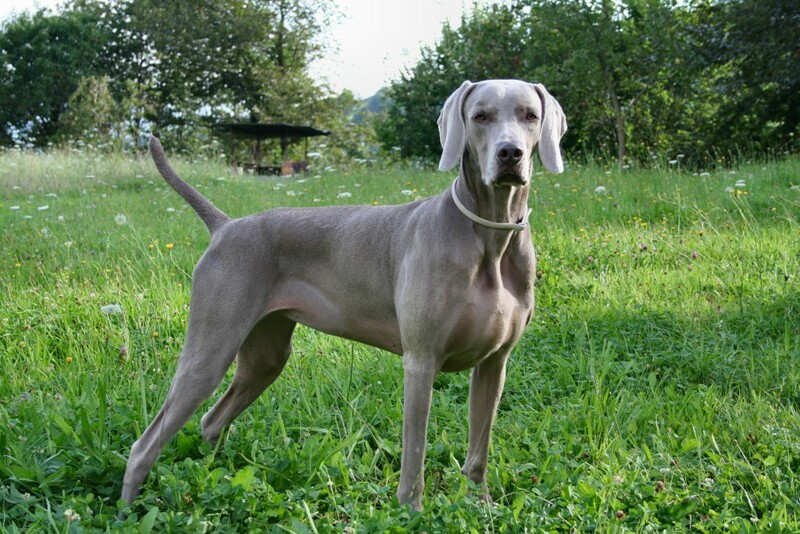 Weimaraners are very intelligent and will usually respond well to obedience training. As with any breed, it is important to being training early in puppyhood to establish acceptable behavior. They can also be independent thinkers and may be stubborn when asked to do something they aren’t interested in. Incorporating activities that cater to their high energy levels during training will help focus their rowdy tendencies as well as prevent them from being bored with training. Simple, repetitive tasks can quickly cause the Weim to act stubbornly and refuse to cooperate. Patient, consistent training will yield the best results and can help strengthen the bond between owner and Weimaraner. 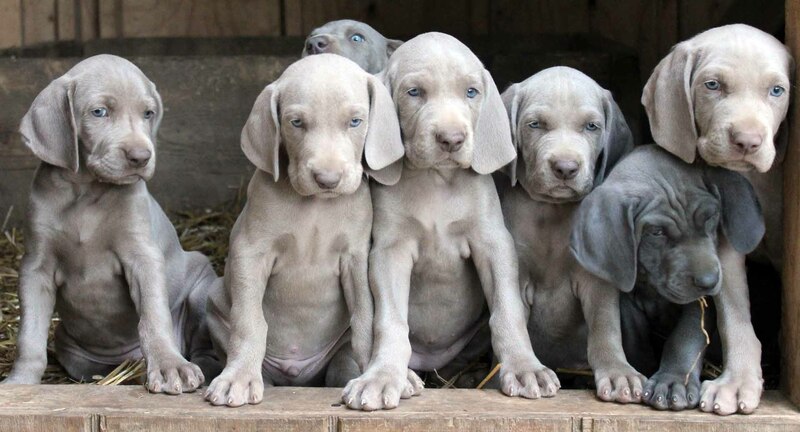 Dating back to the early 19th century, the Weimaraner breed can be traced to the Weimar court in present-day Germany. The exact ancestors of this breed are still unknown, but it is widely believed that the Bloodhound, the English Pointer, the German Shorthaired Pointer, and the blue Great Dane. 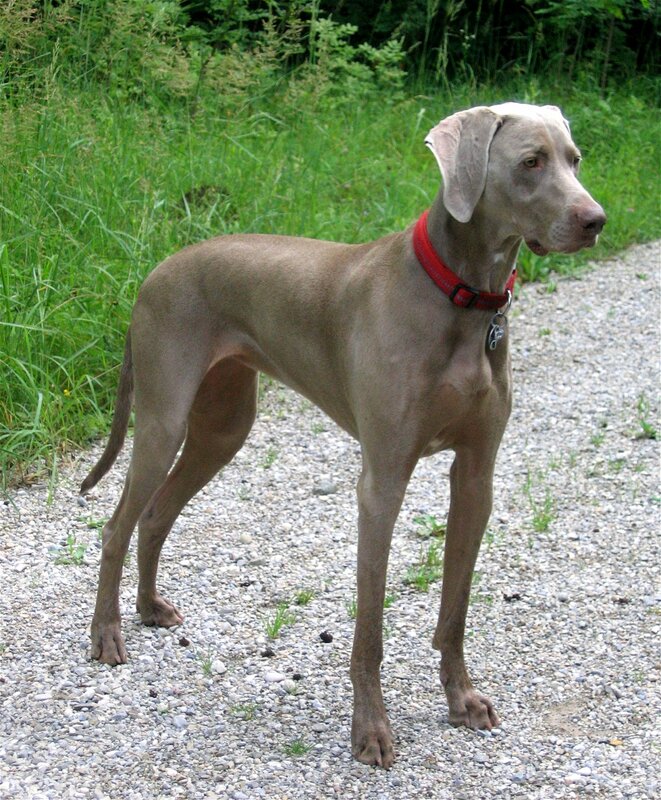 The end result of the Weimaraner was an excellent hunting dog with a regal appearance. While hunting dogs of that era were typically kept kenneled, the aristocracy brought the Weimaraner inside and was highly prized as a companion. These noble “Grey Ghosts” have proved their loving and loyal qualities many times over since their early beginnings.